The older idea of Grammar and its origin. The word “Grammar” originated from the etymology of Greek “gramma”, writing, a letter, and from an effort to build up a treatise on English grammar by using classical grammar as a model. Definitions of grammar According to WHITNEY - English grammar is a description of the usages of the English language by good speakers and writers of the present day. A description of account of the nature, build, constitution, or make of a language is called its grammar. - According to MEIKLEJOHN. Grammar teaches the laws of language and the right method of using it in speaking and writing. - According to PATTERSON. The older idea of Grammar and its origin. The word “Grammar” originated from the etymology of Greek “gramma”, writing, a letter, and from an effort to build up a treatise on English grammar by using classical grammar as a model. What various opinions writers on English grammar have given in answer to the question, What is grammar? According to WHITNEY - English grammar is a description of the usages of the English language by good speakers and writers of the present day. A description of account of the nature, build, constitution, or make of a language is called its grammar. - According to MEIKLEJOHN. Grammar teaches the laws of language and the right method of using it in speaking and writing. - According to PATTERSON. The English word “grammar” relates only to the laws which govern the significant forms of words, and the construction of the sentence. – RICHARD GRANT WHITE. (1) Grammar makes rules to tell us how to use words. (2) It is a record of usage which we ought to follow. (3) It is concerned with the forms of the language. (4) English has no grammar in the sense of forms, or inflections, but takes account merely of the nature and the uses of words in sentences. What ground should grammar cover? We come to answer the question? English grammar is the science which treats of the nature of words, their forms, and their uses and relations in the sentence. Example: Check your spelling and grammar. 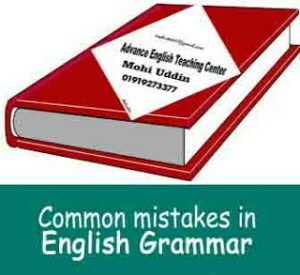 For more clarification, you must read this article What is Grammar. Knowledge World: What is English Grammar?